The Swedetown Recreation Area is owned by Calumet Township. Everyone is welcome – no fees or residence requirements to enjoy this recreation area for jogging, nature hikes, mountain biking and berry picking. Donations in support of maintaining the mountain bike trails are always welcome – there is donation pipe near the parking area. Donations will be put to use by the Swedetown Trails Club for materials, equipment, trail maps and trail signs. 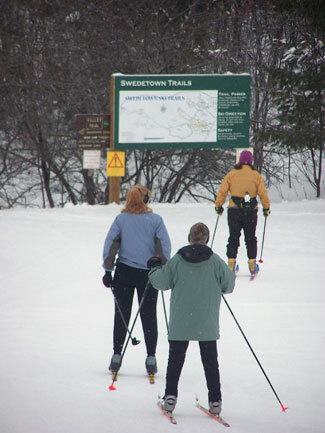 Groomed ski and snow bike trails – use of groomed ski trails and snow bike trails requires season or daily membership in the Swedetown Trails Club. Membership fees are used for cost of fuel and operators for daily grooming, for lighting, for signs and maps and for trail improvements. One day all groomed trails membership is $10. Special evening rate of $6 is offered starting at 4 p.m. For snow bike only, snow shoe only or multi-use trails, the one day rate is $5. Other area top-notch ski trail systems cooperate with Swedetown to offer discounts on combined season memberships – MTU Nordic Center, Maasto Hiihto/Churning Rapids in Hancock and Chassell Classic Trails. Family (two adults living in same household) discounts are offered. Children 17 and under, or still in high school, ski at no charge and will receive a free youth pass. More info including maps and current prices on Keweenaw Trails web site. Membership forms and season tags available at Michigan Tech ticket office at the SDC, Swedetown Chalet, Cross Country Sports (Calumet), Downwind Sports (Houghton) or on the web at www.keweenawtrails.com. Groups are always welcome at Swedetown. In ski season, if you have an out-of-town or other special group larger than 15 planning to use the trails, please contact Swedetown Trails Club at (906) 337-1170 so we can help provide an excellent skiing experience. In other seasons, contact Calumet Township to arrange for the Chalet to be open for your group at (906) 337-2410.